What else can you do, then, if running gites is not a realistic option? You might consider the choice made by English couple, Dave and Sylvia Allet, who followed their dream to make a home for themselves and their two young sons in France in 2004. Like many of us, Dave and Sylvia needed to establish an income to fund their new life, and considered their options carefully. As Dave puts it, "Sylvia spoke no French, and mine was still at a 'comfortable muddle' standard, so clearly trying to find a job in rural France was going to be tricky. We decided that we needed to find a property with a job attached. We considered gites (Gites for sale), vineyards (French properties with vineyards) and organic farms, but we couldn't find anything that offered the potential income we needed within our fairly tight budget." Despite having no prior experience in catering, Sylvia and Dave found that the idea of running a small country hotel, a traditional French auberge, was very appealing. They needed to move quite quickly, as their two sons were aged 11 and 13, and to wait any longer would mean that adapting to the life, language and learning in France, could prove too much of a challenge for the boys as they moved further into their teens (French Education System - Schools in France, French School - experiences of a 14-year-old). An auberge, with its small and friendly atmosphere and a usually scenic countryside location, lends itself very well to family life, and once the Alletts found the property that they were destined to buy, the attractions of this lifestyle became even stronger. The Auberge du Balestie, on paper, didn't hold a lot of interest for Dave and Sylvia, but when they saw the location, looking directly onto the magnificent snow-capped peaks of the Pyrénées at the front and gazing down onto pretty horse pastures and a lovely little lake at the back, they knew this was their future home and business. It was big enough to bring in a reasonable income, with two restaurants and thirteen letting bedrooms, enough outside space to install a swimming pool (Installing a swimming pool in France), and situated close to the popular market town of Mirepoix (Mirepoix Property Guide), where there are shops, schools and all other facilities. The area, in the Ariège department (Ariège Property Guide) of the Midi-Pyrénées (Midi-Pyrénées Property Guide), was also ideal for attracting business to the auberge, as it is a real tourist trap with its hot southern sun, glorious countryside, historical monuments and mountains for skiing (Ski property, Ski Chalets for Sale in France) and walking (Finding property in the best walking areas of France). For an auberge to be successful, location is very important, if not quite everything, so be careful when making your choice. As a rule of thumb, don't buy anywhere that you wouldn't want to stay in yourself. Unless you can see your way to improving it to that standard, of course. Buying any property in France can be a headache for the uninitiated, and buying a property that includes a functioning business even more so. Timing is vital... and yet the best laid plans of mice and men can go astray, especially when you are involving French paperwork. Keep the tranquillisers on standby, and don't leave anything to chance. Be aware that, with any legal process in France, from opening a bank account (Banking in France) to buying a hotel, you will need every certificate you have ever owned in your life, and probably more bedsides. Do not assume that you will get by without any single seemingly insignificant piece of paper, because this is undoubtedly the one thing that will prevent the deal from being done. If at all possible, build in a little more time then you think that you will need, to avoid putting yourself under too much stress if it all takes a little longer than you planned. Dave and Sylvia endorse this advice wholeheartedly, as their experience tells a salutary tale. "We moved to France at the end of May, occupying guest rooms in the auberge. We were due to sign the final purchase papers on Monday 7th June. The previous owners had closed the business from the 1st June, so if all went according to plan we had a week free for them to move out and ourselves to move in, opening for business again on the 7th or 8th. The hotel was fully booked from then, which had seemed wonderful at first, but as delay followed delay, the days flew by and with the final signatures were yet to be placed on the 'acte de vente', the tension began to mount. Problems with the paperwork from the vendor's accountant and the Notaire were causing a hiccup... which goes to show that no matter how carefully you prepare your own paperwork you cannot control the other party!" As the opening day drew nearer, and the expected guests could be sensed beating an eager path to the door, Dave set off on a desperate search for an insurance agent who would allow him to set up the essential insurances to operate the auberge. Unsurprisingly, no one was keen to do this, as the papers were still unsigned, and legally the auberge did not yet belong to Dave and Sylvia. Disconsolate, and certain that they would not only have to turn away their guests but also begin their new lives in debt after paying for alternative accommodation, the Alletts were saved at the eleventh hour by a compromise. The vendors agreed to allow them to cook the evening meal for the guests, but stipulated that it had to be served on the neighbour's land, not on the auberge premises. By French law this absolved the auberge from its insurance responsibilities, as these now fell upon the neighbour, who was fortunately sympathetic to the Alletts' plight. Thus, the tables were moved outside, the guests seated in the warm, summer evening sunshine and the food served. Even the arrival of a spectacular mountain storm couldn't dampen the success of that first evening, despite the sudden necessity to move all the guests to the convenient cover of the empty stable block on the neighbour's land! So, as Dave and Sylvia will testify, if there is a moral to be had from this story, it is that in the hotel trade, you need to be ready for anything, be adaptable and keep smiling through. Oh... and it helps to get on good terms with the neighbours too! The question of staffing is another issue that you will need to consider if you are planning on running an auberge in France, as the chances are that it will be too much work for one couple to do alone. At first, Dave and Sylvia employed an English chef who had been living in France for some time, and was familiar with the requirements of a mainly French clientèle. They also secured the services of a bi-lingual waitress. These two experienced staff members were invaluable in helping the Alletts to get their venture off the ground. Don't make the mistake of thinking that your enthusiasm will compensate for your lack of experience. A little more spent on the employment of reliable staff can be worth its weight in gold, especially when you are just starting out. The Alletts ended up having to re-wire the entire property, having naively taken the previous owner's word that the systems were up to date and that they conformed with requirements. This, as you can imagine, caused extra stress on the already tight finances, and when added to the need for a new fire alarm system to be installed, necessitating the closure of the hotel for some four months, left the Alletts wondering if they would have to sell, up and go back to England as soon as the work was completed. Fortunately, the Alletts survived, and four years on are now running a very successful auberge. The restaurants have an exceptional reputation, and this even though Sylvia now does all the cooking herself (Buying and cooking French food). To boost the hotel overnight and holiday bookings the couple also offer receptions for weddings and other parties and events as well as opening their restaurants to non residents every evening. As any tourist dependant business is by its very nature, seasonal, the restaurant serves a useful purpose in keeping the income steady throughout they year. The auberge has just been inspected for an upgrade to a two-star rating, and this indicated the degree to which it has been improved. Dave and Sylvia have the following advice for anyone who is considering following in their footsteps and purchasing or setting up an auberge. "It's a great life, and can provide a decent income as long as you are prepared to work hard and accept the rules and regulations. Health and hygiene requirements are constantly changing, so keep up to date and never rest on your laurels. Unfortunately you cannot run any kind of business in France that does not involve mountains of paperwork, so either embrace it or don't come to France! The same goes for learning the language (Learning French). You might get by as a private citizen with little more than smattering of French, but if you are running a business, particularly one that involves catering for and dealing with the French as hosts, as suppliers and as ruling bodies, you really need to equip yourself with a working knowledge of the language as fast as possible. Be open to learning new skills all the time, and get used to the idea that although everyone around you is on holiday, you are not... and that can be a little hard to take at times. Holidays for the owners are few and far between in the hotel trade, but do make sure that you allow yourselves some time to live a private life, or it can all become a bit too much." Dave and Sylvia have worked to their individual strengths in acquiring the new skills needed for their success, with Sylvia extending her already formidable range of superb dishes to keep the restaurant high on everybody's wish list, and Dave polishing his just serviceable French into a close approximation of fluency. Auberges in France for sale - how do I find one? 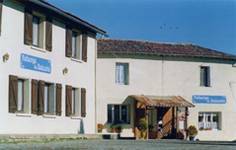 If you are looking to purchase an auberge in France, you could do worse than to begin your search with a look internet sites such as ours, where it is easy to see exactly what is available in any given area. This site also tells you the features of the different regions, departments and towns in France as well, so you can begin to judge the ideal location for your new venture. Once you have found an area that appeals, don't underestimate the value of spending a little time there. Getting to know the place where you plan to base your future life and economic success is worthy research, even if it sounds like a great excuse for a holiday (Holidays in France)!